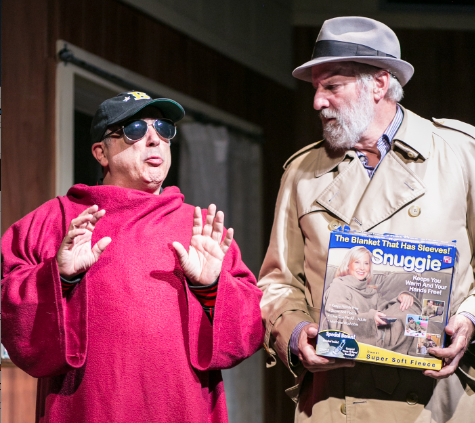 Julian López-Morillas as Howard and David Sinaiko as Charlie, two over-the-hill cold warriors in Jonathan Spector’s new play, “In From The Cold” presented by Just Theater. Photo Credit: Cheshire Isaacs. (“In From The Cold” plays at the Live Oak Theater in Berkeley through November 23, 2014). Jonathan Spector’s new comedy touches on many of the familiar tropes about spies familiar to fans of John Le Carre and other serious spy novelists: loyalty versus betrayal, paranoia versus trust, east versus west, family versus country, winning versus losing, sacrifice versus self-interest. At its heart, it is a family drama set among people whose lives have been touched by history. These are serious themes. But in execution, “In From The Cold” is more Maxwell Smart than John Le Carre’s kind of smart. And that is all to the good. Spector has managed to write a funny, funny play about serious themes that both moves and tickles its audience. His vision has been well served by director Christine Young and an expert cast who know how to milk the laughs (and how!) without sacrificing the play’s emotional heartbeat. Howard is a retired spy. Once high up in the Russian military, he defected to America at the height of the Cold War, in search of a better life for his wife and infant son. Now an old man, he lives in fear that he is being hunted down by vengeful remnants of the KGB. He has faked an injury to lure his son home from Japan, because he fears that spies are out to kill the boy and he alone knows the game and can offer protection. He doesn’t tell this to his son, Alex, because the boy, quite understandably, thinks the old man is bonkers. Julian López-Morillas delights as Howard. Intelligent, quirky, unpredictable, López-Morillas keeps us guessing about Howard’s sanity right to the end. But he never loses our sympathy. We may wonder if Howard is completely off his rocker, but we like him. And he certainly makes us laugh. 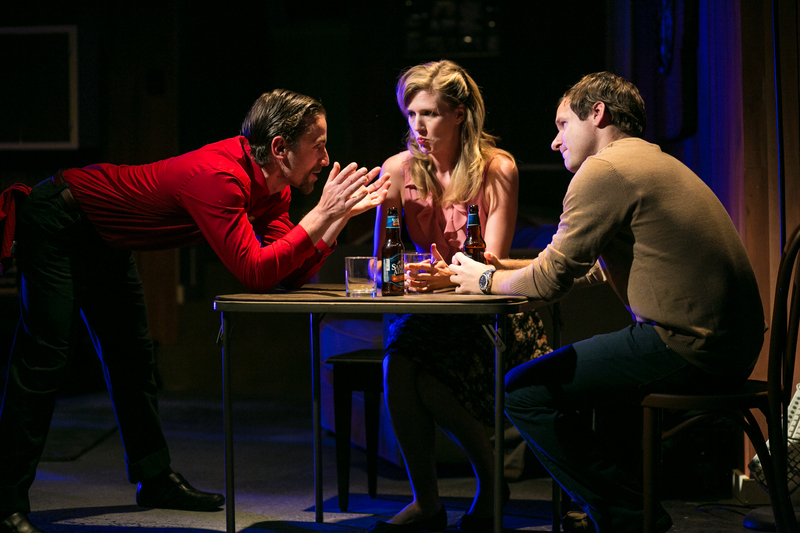 From L to R: Harold Pierce as Damian, Sarah Moser as Carrie, and Seton Brown as Alex. Photo Credit: Cheshire Isaacs. As son Alex, Seton Brown is a riot trying to survive as a substitute teacher at the local high school, reduced to showing 80s popular movies which he hiliariously reinterprets as deeply insightful commentary on the American scene. As a colleague, Carrie, who may or may not be a spy herself, Sarah Moser offers considerable charm. Damian (Harold Pierce) and Howard (Julian López-Morillas) hilariously bond over vodka. Photo Credit: Cheshire Isaacs. As Damien, an old high school buddy of Alex’s, Harold Pierce gives a comic jewel of a performance. His drunken, goofy, ridiculous caricature of a loser working as a manager at Chili’s is the cover for a man who turns out to be unexpectedly sensitive and highly intelligent. Pierce makes us laugh while gradually revealing Alex’s surprising depth. His vodka drinking scene with the old man is a hoot. As two other cold warrior colleagues of Howard’s (Franklin and Charlie) David Sinako provides fine comic support. In the end, the play offers revelations not so much about politics and history as about family dynamics and the hard won rapprochment between difficult but loving fathers and hurt but caring sons. ‘In From the Cold’ will definitely heat up your funny bone, and touch your heart in the end. Nicely done. “In From The Cold”, a new play by Jonathan Spector, world premiere produced by Just Theater. Director: Christine Young. Scenic Designer: Martin Flynn. Costume Designer: Christine Crook. Lighting Designer: Drew Kaufman. Composer/Sound Designer: Chris Houston. Alex: Seton Brown. Howard: Julian López-Morillas. Carrie: Sarah Moser. Damian: Harold Pierce. Franklin/Charlie: David Sinaiko. 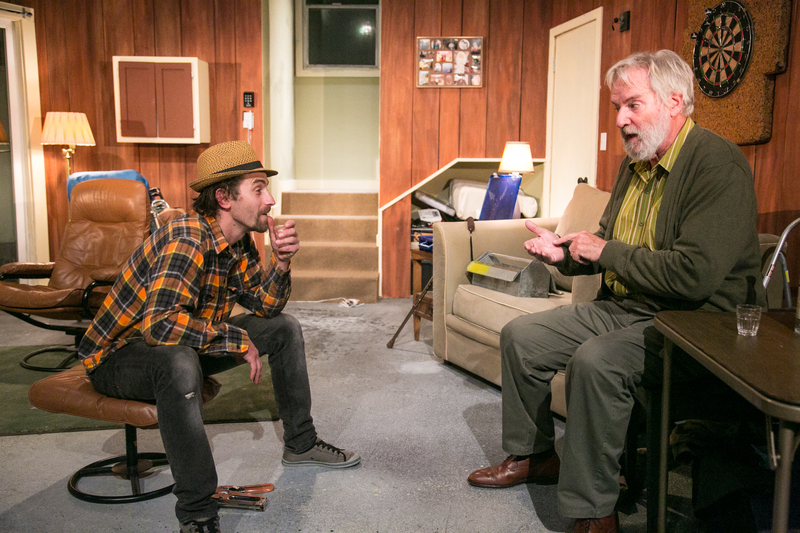 Posted in Reviews.Tagged Charles Kruger, Christine Young, David Sinaiko, Harold Pierce, In From The Cold, Jonathan Spector, Julian Lopez-Morillas, Just Theater, Live Oak Theater, San Francisco Theatre Reviews, Sarah Moser, Seton Brown, theatrestorm.